Burma is showing signs of progress on democratisation. Is India the best country to help it follow through? Thein Sein, Burma’s president, could hardly have timed his trip to India this week much more cleverly. His government has been generating the most favourable headlines of any Burmese regime in decades off the back of a prisoner amnesty, a ceasefire with some (but not all) ethnic minority armies, positive noises on censorship, and the president’s breakthrough meeting with Aung San Suu Kyi. While human rights groups point out that these are only first steps, and that hundreds more political prisoners must now be freed, Burma’s direction of travel suddenly looks encouraging for the first time in a generation. Thein Sein’s other big decision, the suspension of the controversial Myitsone Dam project in the face of Chinese consternation, was also viewed favourably as an indication that his government might finally be inclined to lend an ear to public opinion, rather than listening only to its paymasters in Beijing. But the timing of the decision, announced just days before Thein Sein was due to touch down in New Delhi, was hardly coincidental. It was clear a signal that Burma still represents a strategic opportunity for India. What Thein Sein presumably wants, apart from increased trade, is for Delhi to bang the drum for the dropping of sanctions against his country – a message that sounds much better to Western ears coming from democratic India than it does coming from authoritarian China. The Indians swiftly obliged, with external affairs ministry spokesman Vishnu Prakash speaking of India’s ‘distaste for sanctions (which) do not serve the desired purpose.’ India can now be expected to crank up the volume on its pro-Burma arguments and to start telling the United States and Europe especially to annul sanctions. The Burmese president will also get his desired boost to economic ties, with India undertaking to have a new deep-water port at Sittwe up and running by mid-2013. Indian commentators have been welcoming what they regard as the long-awaited blooming of their country’s Look East policy, with Vietnam’s president having visited India just a few days before Burma’s to further the two countries’ well-established economic and security alliance. ‘New Delhi's policy of engaging Myanmar is paying off,’ said a Times of India editorial,while Shyam Saran, writing in The Hindustan Times, argued that ‘India will no longer face…political inhibitions’ in dealing with Burma, thanks to the reforms taking place in the country. The danger is that India, keen to seize the opportunity presented by the Myitsone Dam snub to China, rushes to reward Burma purely for initiating reforms, rather than for seeing them through. But India can allay such fears by fulfilling the role of both monitor and mentor as Naypyidaw implements democratic change. In her BBC Reith Lectures, delivered in July, Aung San SuuKyi singled out India for special criticism, effectively accusing the world’s largest democracy of abandoning its democratic brothers and sisters across the Burmese border. Now, India has an opportunity to make amends in a way that’s mutually beneficial for both Burma and India. As Shyam Saran points out, ‘the changed relationship between the government and Suu Kyi also opens the door for India to engage with the latter and support her measured steps to expand the political space for civilian, democratic political forces.’ For Thein Sein, this may be an unintended consequence of closer Indian ties, boosting India’s links with the democrats as well as with his own regime. 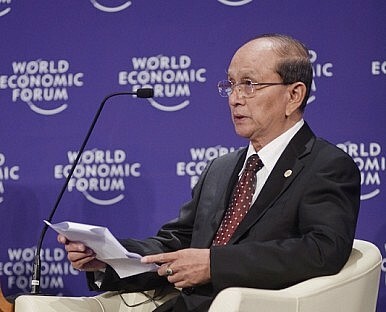 But, if Thein Sein’s political reforms are borne of hard-headed cost-benefit analysis, as they appear to be, then friendly Indian encouragement – and at times pressure – can be used to reinforce the sense among the Burmese hierarchy that the costs of back-pedalling will only increase, while the benefits of staying the course will also only increase. With China experiencing a crisis of confidence over its relations with Southeast Asia, India now has its chance to demonstrate some regional leadership by championing Burma’s cause internationally, with the quiet proviso that support is dependent on real and continuing democratisation.